Frisco, Tex. – The Dallas Stars announced today that the hockey club has signed free agent forward Sean Backman to a one-year contract. 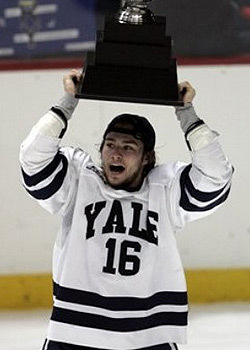 Backman, 23, recently completed his senior season at Yale University, where he finished second on the team in goals with 21 and fifth in scoring with 35 points in just 29 games. He ranked tied for 13th in the nation in goals despite having played fewer games. The Cos Cob, Connecticut, native accumulated 126 points (77g, 49a) in 122 career games with the Bulldogs over four seasons. The 5-8, 165-pound forward was named First-Team All-Ivy in each of his first three seasons, and was named ECAC Co-Rookie of the Year as well as Ivy League Rookie of the Year after his freshman season. He led the Bulldogs in scoring his first two seasons, winning the Murray Murdoch Award as team MVP both years. Prior to his time at Yale, Backman played one season with the Green Bay Gamblers of the United States Hockey League (USHL), scoring 29 goals and 27 assists in 57 games.